I got a few minutes (very few minutes) today to try on the Fast Forward Jacket and play around with the collar a bit. I tried on both a size 8 and a size 10 and found the 8 was way too snug on me overall. The sleeves weren’t particularly narrow but it was a more fitted jacket. The zipper is metal (poop) and goes all the way to the tip of the collar which is nice because it really allows you to customize the neck. The cotton is very, very soft Cotton French Terry and pretty cozy and elegant. 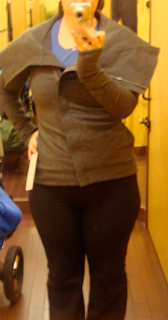 I really liked this jacket but I really didn’t care for it on me. The pockets seemed to sit funny on me in both the size 8 and the size 10 and you can sort of see what I’m talking about in the second picture down. I didn’t care for the jacket unzipped at all and I think this is the type of wrap that you always need to have zipped up and arranged in the most flattering way for you. I also didn’t like the oversized collar laying flat on my shoulders, I much preferred the cowl neck look of the collar up and folded over for me. I would have liked a longer length wrap with a slightly A-lined body instead of a form fitting body that hits at the top of the hips (the body fits like the Define). 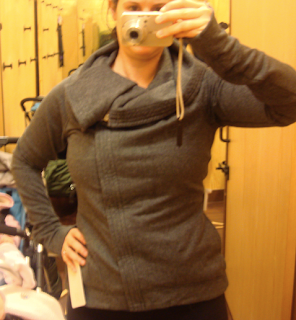 If lulu could just combine the Fast Forward Jacket zip up oversized collar on the Savasana Wrap (zip from top to bottom) and make the wrap more A line I think it would have been more for me. As for sizing, because it’s a narrower fitting body like the Define Jacket, if your between two sizes I would size up to your larger size particularly if you have a larger bust size.